Thank you for maintaining this superb mod. With so many items and ways to craft them, management tool(s) like this are essential for making those items accessible. We have enough trouble remembering all the required materials and their order for regular game progression, much less the variety of optional content available via mods. Rather than finding an item in the browser and tracing a path backwards through its component materials to determine how to progress toward crafting it, having a list of crafting stations would allow us to start from the beginning and see what our options are for moving forward. While many of the crafting stations can be crafted themselves, and are thus in the recipe browser proper, not all are. For anyone that hasn't memorized all the crafting stations and how to get them, it becomes a chore to dig through the browser looking for them. Even if we've already made a station, this chore returns frequently as we familiarize ourselves with each new station. In addition to less screen space, some crafting stations such as the Tinkerer's Workshop and Hellforge cannot be favorited and don't even show up normally when searched. Ideal Solution: The recipe browser includes an option to view all crafting stations (and nothing else). When a station is selected, it is set as the focus item (upper left of recipe browser) and the view reverts to normal. Since the 'Tile' option is only ever available when the focus item is a crafting station, it could even act to display crafting stations when nothing else is a focus item. 'Craft' seems a more appropriate name for it. 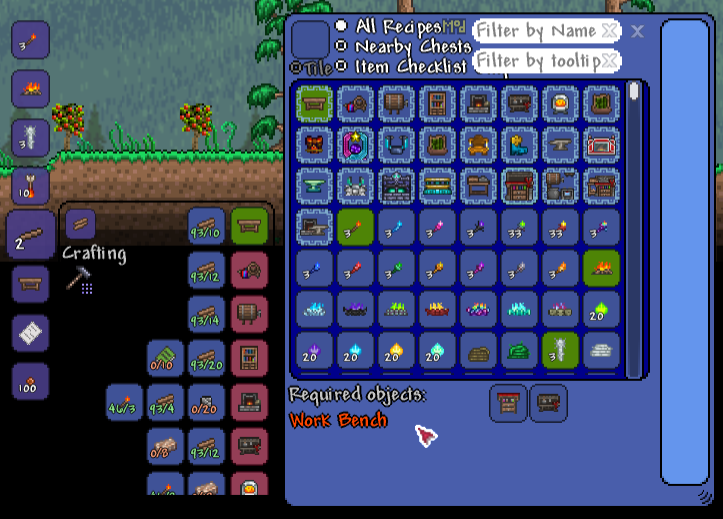 As players progress in the game and collect better equipment, many items become obsolete. Similar to how items can currently be favorited, it would be nice to have the option to hide those early game tools and armor that you'll never need to craft again so that they stop cluttering searches. Also, if players don't like an overpowered item and want to remove the temptation to craft it, what better way than to keep it hidden? Perhaps [alt + right click] would be a good hotkey for it. To ensure that any accidental clicks don't leave important items unsearchable, a new option in the recipe browser could toggle the display of all hidden items where [alt + left click] could be used to un-hide them. Blackbluue and PerryMason like this. Now that you can see the NPCs that drop any given item, wouldn't it be better to not hide uncraftable items anymore? Maybe something that can be toggled with yet another button, just in case someone isn't interested in seeing items that have no recipe. Great job with the mod by the way, every update it keeps getting better and better. All items will be view-able in a later update in the suggested "Item Catalog" panel. Great Suggestions. They will take a while to implement, but I can see their worth. I'm still wondering about the hide option. I can't decide if it should hide the recipe itself or hide all recipes that result in that recipe's result. for some reason when I open the control menu it only says "reset to default" under the mod controls. this also happens when I use the cheat sheet mod. Are you sure it's not just this problem? Is this the case with all items? Can you try deleting "Documents\My Games\Terraria\ModLoader\Mods\Cache\LootCache.json" and then reloading, then seeing if it works? If still no, can you post that file? Hello @jopojelly ! Yes, it is the case with all items I tested. Deleting the LootCache.json to generate a new one didn't work either. Here is the file. Thanks for your atention! Let's wait for @Spoopy_pigeon99 response... Spoopy, can you plz upload your LootCache.json? I would gladly test for you jopojelly, I'm not a modder but I'm happy to help anyway I can! If Spoopy's list is not as big as mine, it can help me figure which mod is the culprit. Edit¹: did a quick small expert world with my major "world generation and new monsters" mods. worked as intended with: Thorium, Calamity, Spirit, GRealm, Crystilium, SpelunkSurge (by yuyutsu) and Mystery Altars (by Graydee). Well, people use the escape key to bring up the inventory so they can take items from their inventory and put them in the lookup slot. If escape key closed the menu, it would be very hard to actually use the tool. Sorry I took so long to reply but I recently had to wipe my laptop so i had to reinstall all my mods but when i started my world and checked the recipe browser the npc thing showed up! Use the new filters and menus to better identify attainable crafting goals. Blazingfireflies, PerryMason, Phupperbat and 2 others like this. This mod looks incredibly useful, but for some reason when running it with tremor remastered it hangs up on rebuilding the loot cache when reaching tremor. It seems no one else has reported likewise and I see no disclaimer about it not being compatible, so maybe I just did something wrong? I am running multiple mods, all gotten from the mod browser, latest version of everything, disabling either tremor or recipe browser "solves" the issue. We noticed this, some code in Tremor was accidentally spawning several million npc, @Jofairden will fix it soon.